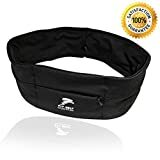  PREMIUM RUNNING WAIST BELT FOR ALL: If you are looking for ways to upgrade your running style, then we got you covered. This running waist belt will provide a snug fit around your waist and allow you to take all of your personal belongings with you. No more missed calls and texts or car keys missing deep in the bottom of your gym bags. Keep them all close to you no matter what you are doing, no matter where you are going! Suitable for both men and women of all ages!  DURABLE & HIGH QUALITY CONSTRUCTION FUEL BELT: Leave all those poorly made waist belts aside and train with this durable belt. Made from high quality Spandex and Lycra blend, this running belt will be your workout buddy for the many years to come. It is designed in such a way to offer you optimal comfort when wearing thanks to its stretchable properties. Its water resistant fabric will allow you to train even when it’s pouring!  UNIQUE BUILT IN POCKETS WITH ACCESSIBLE KEY HOOK: Upon designing this fanny pack, we tried to make it as convenient to use as possible. That is why this waist belt bears 2 built in and easy to open pockets and 1 zipper pocket for extra protection. It is also cleverly equipped with an accessible key hook for you to hang your car keys or house keys. Pure perfection, right?  REFLECTIVE PROTECTIVE BELT POUCH MACHINE WASHABLE: Our waist belt has a reflective logo on the front for your security. Make yourself visible while enjoying a night run or cycling with your friends in the park. When you feel like washing it, simply toss it in the washing machine and let it do the rest. Hassle free cleaning and drying is now a reality! Since your satisfaction is our top priority, this product comes with a lifetime guarantee, just in case you have any issues with it. Stay Alert Cause The Ultimate Running Belt Gear Has Just Been Released! Do you worry about your precious iPhone dropping every time you enjoy your jogging sessions? Are you sick and tired of having things all over your bag and need some organisation right away? If the answer to those questions is yes, then you should keep on reading because we have something that you will highly facilitate the way you exercise from this day on. This fanny pack is designed from weatherproof and waterproof materials and allows you to train in the middle of the rain or alongside the beach when the sun is scorching hot. Being water resistant, this waist belt will never lose shape and will always keep your valuables safe and protected. Our runner waist pack can hold many of your personal belongings while you are enjoying your routine. The zipper pocket can hold your Apple iPhone or Android smartphone. The other easy to reach pockets can carry your cash, credit cards, your favourite motivational music or anything else that might hinder your workout. Customers love this running waist belt pack because it doesn’t bounce and has an even and elegant design. Run in style, play basketball or football with your buddies, go cycling with your kids, or hiking with your family! What are you waiting for? Get yours today and enjoy supreme levels of comfort and security while running.